Free up space with the Flexson Wall Mount for 4 Sonos Amps, the perfect way to wall mount up to four Sonos Amps. Once mounted the Sonos Amps are quickly fitted. 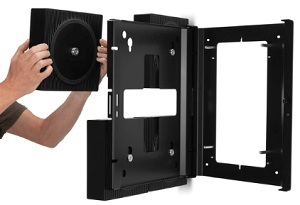 The clever hinged frame is designed to make cabling simpler and if required the connections are easily accessible once the install is completed.